Switching your shampoo to a completely natural product is a great option if you want a healthy scalp and hair. One of the best choices is Christina Moss Naturals Organic Shampoo. Not only does this shampoo use all-natural ingredients, but as the name of the product suggests, they are all organic. If you’re trying to live a healthier lifestyle overall, starting with products like this can make it easy to see how well natural solutions work. Christina Moss Organic Shampoo allows you to safely and gently wash your hair without the use of harmful chemicals and parabens. These chemicals can either cause a build-up on your scalp to create itching and flaking or dry out your skin. Parabens are preservatives to give shampoos a longer shelf life. You know it’s not healthy to ingest foods that contain preservatives, and using a hair product with them can be just as harmful to the body. Because of parabens, and other damaging chemicals found in many hair care products, more and more people are switching to natural solutions, like this shampoo. It’s safe and effective for all hair types, and for people with skin conditions. If you’ve arrived at this page to buy this product, CLICK HERE. You’ll also be able to read some of the latest feedback from people who are currently using this shampoo. In this article, we will provide a full review of this organic hair product. We will hold it up to several different review criteria and offer a specific rating for each category. In addition to rating these categories, we will cover how to use the product, and any potential advantages and disadvantages you might experience when using it. How Can I Benefit from This Shampoo? Is it Medically Safe to Use? Should I Buy Christina Moss Naturals Organic Shampoo? With so many hair care products on the market (and an increasing number of all-natural products), knowing as much as possible about each of the following elements can help you to make a more informed decision. The benefits of this shampoo start with the fact that it uses all-natural ingredients. The company also makes a point to let their customers know that their products are not tested on animals. Ethically, these are two great starting points. However, this product is more than just a solution for people who prefer to shop organic. It can make a big difference for those who struggle with skin conditions of the scalp, or dry, brittle hair. The shampoo itself is beneficial for your hair and scalp, no matter what type of hair you have. It is a gentle formula that won’t strip your scalp of its natural oils and can be used every day. Not many shampoos can be used as frequently. It is hypoallergenic, and even safe for babies to use because of the gentleness of the formula. Some shampoos and conditioners can be so heavy which mean that they’ll cause a buildup of product on the scalp, which can cause itching and flaking. This shampoo won’t ever cause a buildup of oils, but it also won’t cause dryness or irritation, leaving your skin moisturized and healthy. The formula for this shampoo is really where it shines, boasting all organic, natural ingredients. It is free of parabens, dyes, sulfates, and synthetic fragrances that could cause irritation to your scalp, and damage your hair. If you already have a sensitive scalp or damaged skin on the scalp, this shampoo can help to soothe it with healing aloe vera. Organic oils will lock in the right amount of moisture and leave your scalp healthy and hair shiny. Because of the lack of chemicals and preservatives, it’s safe to use every day. Just make sure you’re not washing your hair with extremely hot water, or it could still dry out your scalp. When it comes to the dedication the Christina Moss company puts into their products, it’s clear they are taking the word ‘organic’ very seriously. So, why can it be beneficial to buy products with organic ingredients? Organic involves using ingredients that are free of artificial additives. The ingredients must also use as few artificial methods as possible. Because these ingredients are mostly plant-based, they have to be grown without the use of synthetic pesticides. Organic ingredients in cosmetics can be better for your skin, hair, and entire body because they are free of anything artificial and synthetic. Ingredients that have been developed in a lab or are man-made can eventually cause skin irritation since they harbor so many chemicals, preservatives, etc. 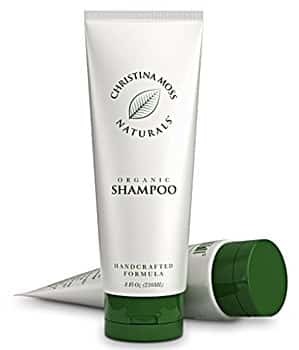 CLICK HERE to Buy Christina Moss Naturals Shampoo on Amazon.com! Because there are only natural ingredients in this product, it’s very safe to use. Some people are prone to having negative reactions to certain chemicals. Some chemicals can even severely harm the skin of the scalp. This product also claims to be gentle enough to use each day without stripping your scalp of oils or drying out your hair. It is even gentle enough for children and babies to use. Unfortunately, even some baby shampoos contain chemicals. If your child has sensitive skin, washing their hair with this can provide soothing relief without danger. The organic ingredients in this shampoo are safe and gentle. Any potential side effects may be a result of an allergic reaction to one of the ingredients. Be sure you know the entire formula before using it on your hair if you have allergies. Another 100% natural product that is worth considering is Tru Moroccan Repair Shampoo. Buyers are reporting good results. Feel free to read our impartial review! While this isn’t a medicated shampoo, some people use it as a detoxifying product. If you’ve been using traditional hair care products for a long period, you can use this as a sort of reset button for your hair and scalp, starting a regimen with it to cleanse your skin. It has been used on people with dandruff, dry scalp, seborrheic dermatitis, and eczema. In most cases, the skin condition is less severe after several uses. So, what can you expect from daily use? If you do have a skin condition or just an itchy, dry scalp, the ingredients in the shampoo will help with moisture. Because they are all-natural and organic, existing skin conditions are less likely to become irritated or inflamed. With no harmful chemicals or preservatives, the risk of drying out your hair or scalp further is extremely low. In a short amount of time, you should notice healthier, hydrated skin, and softer hair. One thing to note is that you shouldn’t expect an overly floral or perfumey scent when using this shampoo. You may be used to synthetic shampoos that leave your hair smelling great all day. Instead, the addition of rosemary to this formula will leave your hair with a fresh, light scent. If you prefer a stronger scent to your hair, you can follow up this shampoo with a styling product that contains natural perfuming ingredients. With so many shampoos and hair care products on the market, it’s easy to overlook how confident a company might be in their product. However, a satisfaction guarantee can offer peace of mind. Christina Moss Naturals backs up this shampoo with a satisfaction guarantee. They also ensure that their product has a six-month shelf life. For a shampoo without preservatives, that can be a big selling point. If at any point in the first six months after purchasing, you notice something wrong with the shampoo, you can return it for a full refund. Not only is the company confident this shampoo will work to give you a healthy scalp and hair, but they are equally confident in how well their natural ingredients withstand the test of time. So much so, in fact, that they guarantee it. This organic shampoo can be used regularly for a variety of different reasons. It can be used as a daily cleansing shampoo. However, some people use it for scalp conditions. These include seborrheic dermatitis, or just dry, flaky skin. Massage into scalp and through the ends of your hair, getting even coverage. Work up a dense later with the shampoo. The company makes it clear that this shampoo is designed for all types of hair. So, the directions remain the same, no matter how thick or fine your hair may be. Be sure to work the lather into your scalp, and not just the ends of your hair. If you have sensitive skin or dry scalp, it can help to lock in moisture and provide soothing relief when applied properly. If you’d like, you can follow up this application process with one of Christina Moss’ organic conditioners, as well. If a lack of moisture is causing an itchy scalp, the right conditioner can offer a hydrating boost. This natural shampoo has quality ingredients, is safe to use regularly, and won’t dry out your hair or scalp with harmful chemicals. However, as with any product, there are some drawbacks to consider before making a purchase. Let’s weigh out a few of the pros and cons, so you can be better informed in deciding if Christina Moss Naturals Organic Shampoo is right for you. It is free of parabens and preservatives. It contains only organic ingredients, not tested on animals. Some of the ingredients can help to soothe a dry, itchy scalp. Essential oils can lock in moisture for your scalp and hair. The formula is gentle enough to be used each day without damaging your hair. The product itself, and the packaging is environmentally-friendly. The freshness guarantee only lasts six months. The lather it creates can be dense and heavy compared to traditional shampoos. Because there are no perfumes, it doesn’t give your hair a lasting pleasant scent like other shampoos. If you’re looking for a shampoo that won’t strip your hair of its natural oils and can add moisture to your scalp in a natural way, consider this product. If you are prone to hair or scalp damage due to an overuse of products with chemicals, switching to a natural solution like this can help to restore the health of your skin and follicles. It can get rid of dryness and itching, and leave your hair shiny and smooth. The best part about this shampoo is that it’s designed for everyone. You don’t have to have a scalp condition or dry hair to experience the benefits that come from a great combination of natural ingredients. If you’ve been looking for a quality shampoo that you can use every day, this is an option that’ll make you feel good. However, if you do have something like dry skin on the scalp or damaged hair, it’s even better. You can treat your scalp the natural way, without harsh chemicals and a medicated shampoo. In just a few uses, you’re bound to see results and have healthy, hydrated skin. We hope the information provided in this review has been helpful. By breaking down the different characteristics of this shampoo, you can get a better idea of how you can benefit from it, and if it’s right for you. CLICK HERE to Buy This 100% Natural Shampoo on Amazon!